Every time a natural disaster occurs, all media channel are seen to be screaming out “It was a disaster waiting to happen”. And every heart wrenching video of innocent people losing their loved ones makes one wonder – Why this Nature’s Fury? It’s like Mother Nature looking sad-faced and trying to talk to the self-centered human race, saying “this is the self-destruction you are breeding and causing harm to yourselves”. While many may just sit back criticizing the system each time a natural calamity occurs, we at Aahana Resort, are working otherwise. Located on the border of the pristine expanse of the Corbett National Park in Nainital; we are actively engaged in nurturing an Eco-sensitive environment in our small way. We like to call it luxury with sustainable tourism, where nature – our guests – and the various participants in this Eco-system are seen contributing their bit to minimize environmental abuse. The tourism sector globally, contributes billions of dollars as revenue for hotels and resorts, and also to growth of each location. 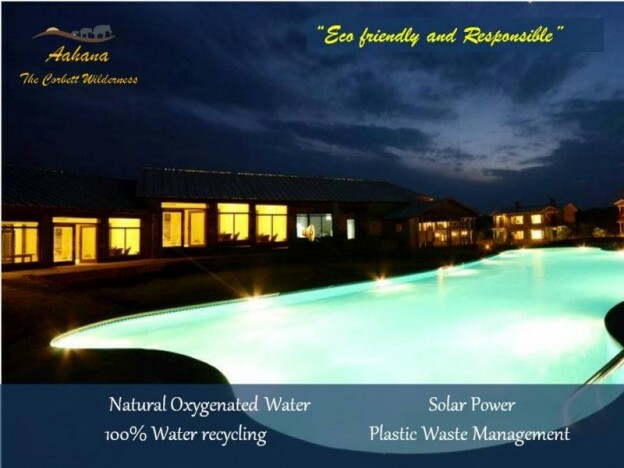 So it was only prudent for us at Aahana Resort, that we woke up to be more responsible and eco-friendly. At Aahana, hospitality is not all about revenue generation, it is also about reaching out to the local community and creating goodwill among its customers and guests. Even our guests are encouraged with optional towels, laundry and requested minimal usage of toiletries. For we understand that Eco conscious guests appreciate our activities to keep Aahana an Eco-friendly Resort. We have taken a number of small steps to create greener world by using recycled materials for stationary and laundry bags. We use small refillable toiletries in the bathrooms and try to keep our banquet setups clutter free by using less of linens and frills. One of the most interesting steps we took is using recycled water for our gardens and actively engage in rainwater harvesting. During the day we put to use the abundant solar energy for our boilers. And we have invested in state-of-art waste management systems for making composts and have a sewage treatment plant. From the resort management point of view, yes, making and maintaining an eco tourism resort like Aahana has been capital-expensive. But we understand that it will be a profitable process in the long run wherein we will achieve sustainable development and give back to our Eco-system. We believe, it is our responsibility to ourselves, and for our future generations to do our bit for Mother Nature. We believe, it is our responsibility to keep looking for innovations and initiatives that can help conserve our social resources. And while we at Aahana Resort go forward on our mission to make this popular destination environmentally friendly, we also eagerly look up to you to share your good wishes for this green endeavor. Make a beginning by sharing this message with your family and friends, and help Aahana Eco-Tourism Resort, Go Greener! Signup for stories on luxurious elements of Nature & Culture from the Wilderness. Why Corbett Can be the best Winter Vacation Destination?